The Boeing P-12 (Model 102) was the equivalent of the US Navy F4B-1 (Model 99). It was developed from the Model 83 and Model 89 prototypes built as a private venture to replace the United States Army Air Corps (USAAC) PW-9s and US Navy F2Bs and F3Bs. The new aircraft was smaller, lighter and more agile and had a higher top speed and overall better performance. They were the last biplane fighters for the USAAC and became second-line fighters for the US Navy shortly after the beginning of World War II. There was not that much difference from earlier Boeing models—it used the same Pratt & Whitney R-1340 Wasp engine as the F3B, but was an aculmination of various refinements Boeing had developed in the previous seven years of fighter design. 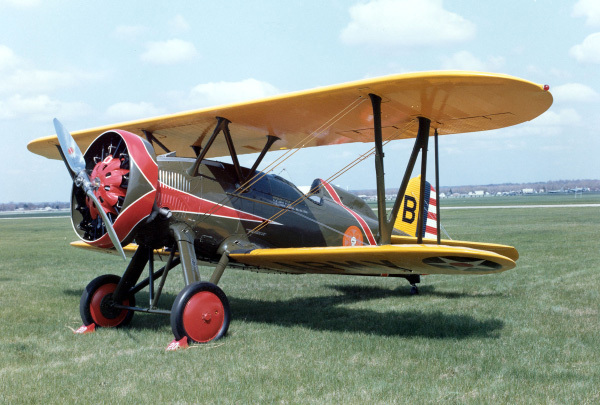 Although biplane designs were disappearing in civil aviation, they were still in demand by the military, still following World War I fighter requirements. Experimental monoplane fighters began appearing the USAAC in 1930 and for the US Navy in 1933, but it would be another four to six years before production monoplanes would be delivered for service use. Boeing supplied the USAAC with 366 P-12s between 1929 and 1932. Production of all variants totalled 586. The Model 100 was a commercial equivalent of the P-12/F4B and was produced for export. One 500 hp (373 kW) Pratt & Whitney R-1340-17 radial engine. plus 244 lbs. (111 kg) bombs externally. 1. Peter M. Bowers. Boeing Aircraft Since 1916 New York: Funk & Wagnalls, 1968. 145. ©Larry Dwyer. The Aviation History On-Line Museum.All rights reserved. Created November 12, 2009. Updated October 13, 2013.